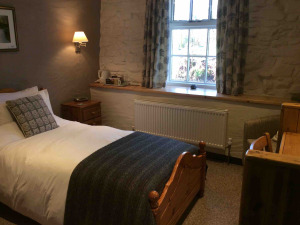 Brynarth Country Guest House Guest HouseBrynarth Country Guest House is nestled in rural splendor amongst some of the most stunning scenery in the Ystwyth Valley. It is owned and run by James Dwyer & Stuart Betts and is situated within the beautiful countryside in the foothills of the Cambrian Mountains. Brynarth is ideally located to access not only the many attractions in Ceredigion, The Ystwyth and Elan Valleys but is close enough to easily enjoy the bustling coastal town of Aberystwyth itself. The 17th Century farmhouse and barns have been tastefully and sympathetically renovated in keeping with Brynarth’s age and time in history, with two acres of bluebell woods included within it’s eight acres of grounds, Brynarth hosts an abundance of wildlife - including regular fly-pasts by red kites, successfully re-populating this area of mid-Wales. Bats, owls and pheasants are usually both seen and heard daily. Crystal clear spring water comes down from the mountains to supply Brynarth even through the driest of summers. It is the perfect place to relax and unwind, whether for a weekend break or a longer stay, and if you’re feeling more energetic there is so much countryside waiting to be explored, particularly by foot or bicycle. The accommodation includes two double rooms in the main farmhouse, both with large en-suite shower rooms, one with sitting area and dual aspect windows looking out over the countryside. Just across the courtyard, The Old Dairy Barn has 5 delightful en-suite rooms, 2 being singles, plus a further double and a twin that share a bathroom and are ideal for use as a family ‘suite’ or small group. All rooms are centrally-heated, have free Wifi, radio alarm clocks and hair dryers, tea and coffee making facilities, Welsh toiletries and egyptian cotton towels. Rooms are serviced each day to make your stay as comfortable as possible. An iron and ironing board are available on request. Our Bed and Breakfast rates include a cooked breakfast of your choice from our menu, plus fresh fruit, cereals, yoghurts and toast and preserves. We pride ourselves on offering as much local, fresh produce as we can, most of our eggs come from our own chickens! Breakfast is served in the warm and welcoming farmhouse Dining Room. Evening meals can be arranged for groups of 8 or more guests and are bookable in advance. Dinner is normally served at 7pm and comprises a set menu of two courses, a main course and dessert, with after dinner coffee/tea/mints for £25 per person. If you wish to dine with us please note that we require at least 48 hours notice. Packed lunches are also available by arrangement, if you are planning a day out walking or cycling. Guests can relax in front of a log fire in the lounge with it’s adjoining licenced Snug Bar. We are fully licensed with a good range of beers, wines and spirits. To enhance the evenings, there is a separate Games Barn where one can enjoy table tennis, pool & darts, here there is also a large colour television with comfy sofas. We have a large car park and also offer secure, covered parking to motorcyclists and cycles. We welcome ‘Well-behaved’ dogs by prior arrangement only. We have designated rooms that can accommodate your pet so please contact us first to check availability and requirements. We allow a maximum of 2 dogs per room. We charge £10 per dog for a one/two night stay, and then an additional £5 per night thereafter. We have a ‘woodland walk’ around our field for you to walk your dog, and there are lots of great dog walking tracks close by. Brynarth hosts an abundance of wildlife, we are well located for easy access to many Nature Reserves, Cors Ian Nature Reserve is only 400 yards from us. We have a large cosy guest lounge, dining room and games barn plus 8 acres of grounds with seating areas and outside tables and chairs. 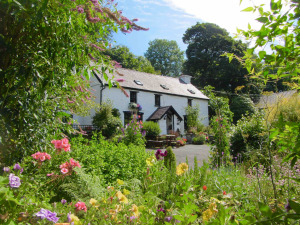 Brynarth Country Guest House sometimes limits bookings to 2 or more days. WiFi, Radio/alarm clock, hospitality tray, hairdryer and Guest Welcome folders. Egyptian cotton towels and Welsh toiletries. Seeing area. Room 8 sometimes limits bookings to 2 or more days. In Lledrod, turn left at the hairpin bend, signposted to Ystrad Meurig, and follow this road up through the village houses. Go up and round to the left, keep going for about 2 miles then take the narrow left turn at the blue ‘Brynarth’ sign to Trawsgoed/Crosswood, carry on down this road for about half a mile and you will find us on the left hand side. You will see the car park entrance first then the gated drive immediately afterwards. Please use the car park unless you are a Blue Badge Holder; there are pedestrian steps in the corner directly down into the main courtyard. Blue Badge holders please call ahead and we will be watching out for you to assist with baggage and show you where to park your car. From Carmarthen and the South, follow the A485 to the north, go through Tregaron taking the left at the junction in the middle of the town, then look out for the steep descent into Lledrod and the hairpin left bend. Take the right turn immediately on the hairpin bend, signposted to Ystrad Meurig, then follow as above. If travelling on the B4340 North from Pontrhydfendigaid ignore any SatNav directions to turn left towards the river ford, carry on and turn left over the bridge, then turn left again following the blue ‘Brynarth’ sign. Just under a mile you will reach a T junction, bare left here, at this point some SatNav’s will try to direct you down a dead end track back towards the river ford again!... ignore this and carry on following the blue ‘Brynarth’ sign for a mile and a half, up the steep hill, over the hump back bridge, carry on even though your SatNav may have told you that you have ‘reached your destination’ you will find us on the right-hand side. If travelling south from Aberystwyth on the B4340 follow this road for just under 7 miles until you reach Trawsgoed, then take the right turn over the bridge and follow the above directions, towards Brynarth. Made to feel so welcome by our hosts who did everything possible to enable us to make the best of the location and local amenities and attractions. Serviced Accomodation Brynarth Country Guest House, Lledrod, SY23 4HX •	Brynarth is a 17th Century farmhouse with guest rooms both in the main Farmhouse and also in the converted barn across the main courtyard. •	There are 9 guest rooms, 3 of which are on the Ground Floor in the Barn. These include a single and a double with level access (but not wheelchair-accessible due to doorway width) which both have en-suite shower rooms. These both have a step down into the shower room and then a step up into the cubicle itself. There is another single room, again with level access, this time all the way through into an en-suite bathroom with full bath, again doorway-width precludes wheelchair accessibility. •	All other bedrooms are on the First Floor in either the Farmhouse or the Barn and access is via stairs only. •	The Dining Room, Lounge and Snug Bar are all in the Farmhouse. The front door has 2 uneven, slate external steps then a timber threshold into the hallway. •	There is then a 3” step from the hallway up into the Dining Room. •	The Lounge enjoys level access from the hallway, although there are 2 uneven slate steps up into the Snug Bar from the Lounge. •	The bathroom for Guests use whilst in the main Farmhouse is on the First Floor, access by stairs, handrail on the left as you ascend. •	Assistance dogs are welcomed at Brynarth, please discuss prior to booking as not all rooms are suitable for dogs. All dogs must be on leads at all times, there is no ‘free run area available. •	We have a large Car Park behind the Games Barn, 25m from main Farmhouse. This has a stony, slightly uneven surface and either 8 stone steps down into the main Courtyard or a sloping walk around via the driveway. •	All guests are welcome to load and unload cars in the Courtyard but then to reposition them into the Car Park. Blue Badge holders will be shown a suitable area to park at the side of the Courtyard. •	Assistance is offered and freely given to all guests with luggage. •	The closest major town is Aberystwyth, some 12 miles away, about 20 minutes by car. There is a main train and bus station, large taxi rank and plenty of shops, banks and restaurants. •	There are limited buses from Aberystwyth to Tregaron, which stop at Lledrod village, about 2 miles from Brynarth; we are happy to collect guests from there or from Aberystwyth by arrangement. •	Our Ordnance Survey reference is Landranger 125 ref 669698. •	Taxis can be booked for Guests to be collected from Brynarth but we would recommend advance booking due to our remote location! •	Anti-allergenic pillows and duvets are available on request. •	Digital, colour television is available in a comfortable seating area within the Games Barn, access is via 2 sets of 5 stone steps. •	Mobile phone reception is poor to non-existent in this area depending on network, guests are welcome to use our landline if required although a charge or charity donation may be requested. The age and style of Brynarth may preclude the less-able from wishing to visit – but please do call and discuss your requirements before deciding against a stay as we do what we can to ensure the comfort and satisfaction of each and every guest and may well be able to talk things through and enable your enjoyable visit to take place! There is nothing like being able to sit in our lovely grounds, with the wind whispering though the trees, the chirping of the birds and the croak of the frogs in the pond to make one feel at peace – and why should we have this all to ourselves? Go to sleep to the sounds of the owls, the complete darkness comforting you and allowing you the best rest for years, or just stand in the courtyard and gaze in awe at the abundance of stars in the night sky. Come and share it, we will help you however we can to make the most of this tranquil setting, and you know what they say – ‘Where theres a will, theres usually a way!